This was my first attempt at fixing a broken Cuisinart cordless kettle. The original symptoms: I notice the kettle occasionally turns itself off. If I turn it back on, it works again for a little while. This kept up for a day or so, then it refused to turn on at all. I open it up, and one pole of the dual-throw relay (really, a combination on/off switch and thermal switch) had melted its plastic supports. The contacts no longer touched, so the kettle got no power. The first fix: That pole of the relay was shot, but luckily there was another identical mechanism on the other pole. I could replace the broken pole with some other type of safety cutoff device, and it would be good as new. Ideally I’d use a thermal fuse for this purpose. The local Fry’s didn’t have any, so I used two 7 amp pico-fuses in parallel. Not ideal, but better than nothing. So.. my fuses did their job, and my new wiring was fine. When I measured the resistances during reassembly, everything seemed fine. The first few pots of water after this fix are uneventful. Then I notice the bottom of the kettle (just under where my new wiring was installed) started getting really hot. Like, 300 degrees. This was starting to melt the plastic a bit. I open it up, and my wiring harness is what you see above. So, what happened? I failed to fix the reason why the relay failed in the first place. I was assuming that the relay just used shoddy plastic, and it overheated because it was so close to the heating element. I assumed it was a design flaw. But, the other (presumably identical) relay pole was totally fine. It turns out that the original failure was a loose crimp in the joint that appears rightmost in the photo. The crimp wasn’t quite tight, so the wire rattled around in there a little. This added about 1 ohm of resistance when it was in just the wrong position. A manufacturing flaw. This kettle nominally runs at about 12 amps. 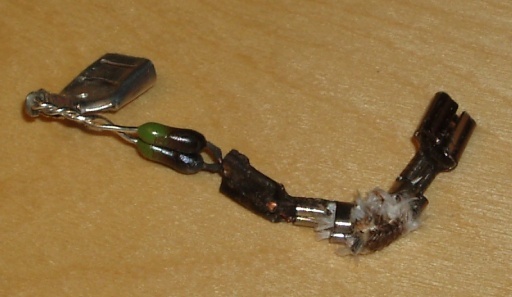 At 12 A and 120 V, a 1 ohm resistor will dissipate 144 watts. Yow. So, I just replaced that entire section of the wiring harness with two new fuses and two brand new crimps. First pot of water was a success, and I rewarded myself with some irish coffee. We’ll see how well it holds up. I might find myself ordering some slightly better quality crimps and some actual thermal fuses if this fix also has problems. This entry was posted in Projects and tagged fail, fixit, high-power, mini-project on September 19, 2008 by Micah.